Melbourne Law School researchers Professor Bernadette McSherry, Dr Anna Arstein-Kerslake and Dr Piers Gooding will lead the research project titled "Unfitness to Plead". 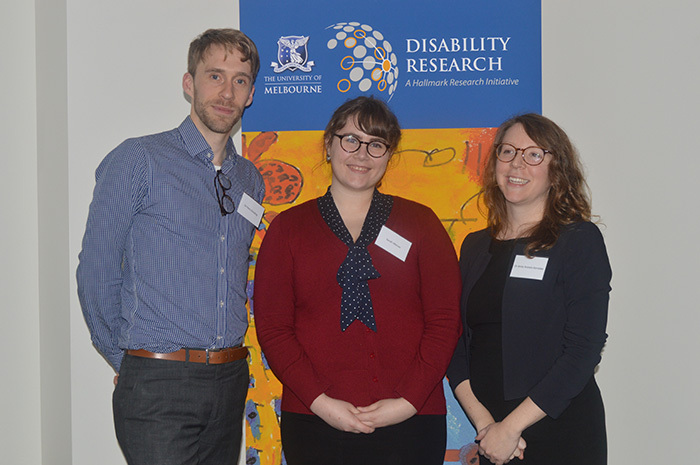 The two-year research project, jointly run by MLS, the Hallmark Disability Research Initiative and the Melbourne Social Equity Institute will aim to develop practical and legal solutions to the problem of people with cognitive disabilities being found “unfit to plead”. Professor Bernadette McSherry says the project is an Australian first. Those found unfit to plead in Australia can be subject to indefinite detention, for an uncertain period, in prison or secure hospital facilities. Joint Chief Investigator Dr Anna Arstein-Kerslake says the program fills a noticeable gap in the provision of formal support to prevent disability-based discrimination. “A number of law reform initiatives in Australia have recommended that accused persons with disabilities at risk of being deemed unfit to plead should receive formal support. Yet no such support for criminal proceedings has been developed or evaluated. This project will fill that gap,” she says. Leaders in the fields of disability, human rights and criminal justice attended the two-day workshop, which took place over 19-20 May, and included training of "supporters" to assist accused persons with disabilities. Supporters will work alongside lawyers from community legal centres to provide support for people with disabilities. They may assist the person to communicate to their lawyer, or refer the person to a relevant service as needed. The supporter may contact family to assist in communication or work with courts to improve accessibility measures in courts. The launch program fits into a two-year cross-jurisdictional analysis of unfitness to plead laws in Australia. Dr Gooding, the postdoctoral researcher for the project, says the research strikes at a fundamental tension between securing the right to a fair trial and ensuring access to justice for persons with cognitive disabilities on an equal basis with others. The project aims to find ways to reconcile that tension. “One of the reasons for finding someone unfit to plead is that it would be unfair to subject a person to a trial when he or she is unable to play any real part in that trial. “However, the adverse consequence is that those found unfit to plead may be subject to detention, for an uncertain period, in prison or in secure hospital facilities,” he says. It also seeks to illuminate the inequality with which the law is applied. The research has garnered important attention in the policy sphere, from lawyers, disabled peoples organisations, court staff and politicians.